After another short spell of snow we are once again looking forward to Spring happening here. I keep checking the pond for frog and toad spawn but have seen none so far. This week has been all about pets. 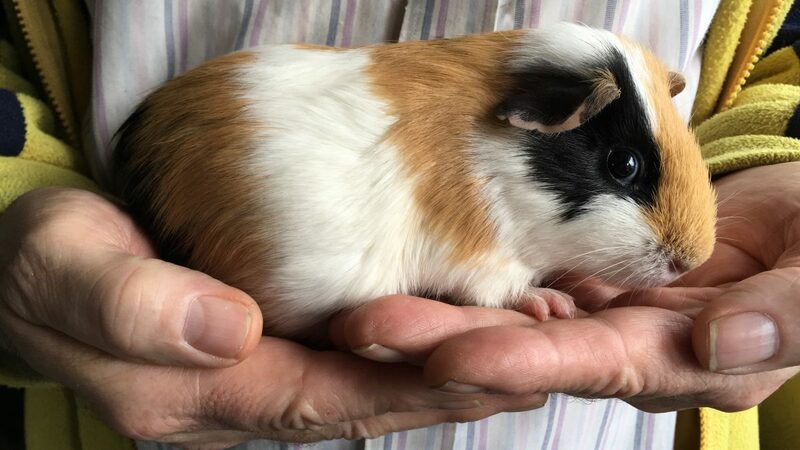 Hubby is sighing loudly as I introduce another guinea pig to the menagerie. My existing boar has been looking very sad and lonely since my other piggies died a year ago so i decided to get him a cage mate. He is a short haired tri-colour and as you can see looks totally different depending on which side you are viewing him. He’s just 12 weeks old and doesn’t have a name yet, I’m waiting for him to tell me what it is. No I’m not mad, I always like to see how a pets personality develops or maybe they do something particular that will give me inspiration for a name. I’ve spent the last three days introducing him to Snowy and so far its going really well. Snowy is four years old now so all he wants to do is eat his veggies and get a good nap in. He snuggles down in the newbies cage and nods off, its so sweet to see them getting along and I’m hopeful they will bond okay fairly soon. We are having a tree chopped down today in the garden with lots to do in preparation for that so i’ll sign off and say have a good week and more smiles than frowns. If you’re new to this smiling lark then check out Annie’s lovely blog A Stitch in Time for more happy posts. Had to come back and tell you another cute story, this time about gerbils I bought. At that time I had Dog, my first cat. Yes, there is another story to be told there, too. I couldn’t think of good names for the gerbils, so I named the first one Libreg, which is backward for gerbil. Then I saw Dog sniffing around the cage one day and decided to call the second one Lunch. I named Dog (actually doggie-doggie) because I had read you should have repetitive names like kitty-kitty. I never wanted Dog to ever go outside, but feared if he ever got out someone might be able to lure him away by calling kitty-kitty. Dog knew his name within weeks of when I got him, and he never once responded to anyone calling him kitty-kitty. And believe me, friends tried when they heard how he got his name. 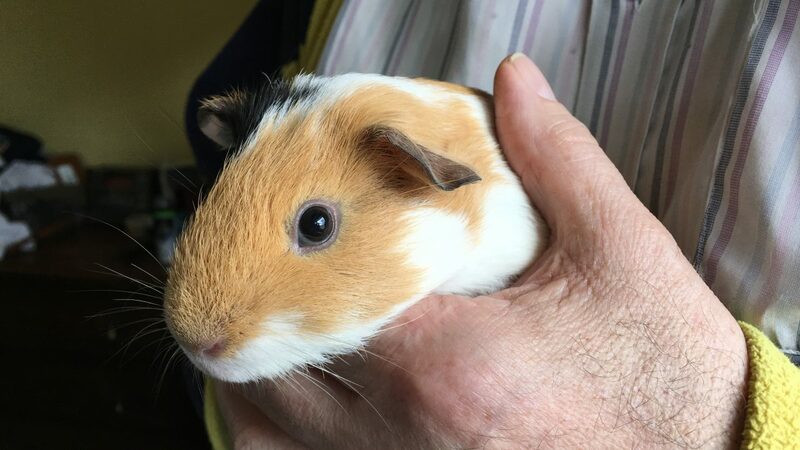 What an adorable and lovable guinea pig. I totally agree with you about the name. It took nearly three weeks for me to name Bleubeard. I finally decided his little beard he had when he was young went well with the bluish color his fur put off in a certain light. I was so very impressed that you added this furry friend to your brood. Hope you have a great Friday and weekend, too. In answer to your question, yes the Museum costs money ($8.00 USD for adults), but because my friend Sally and I went on Smithsonian Museum Day, it was free. What a lovely new addition to the brood. You’ve left me oohing and aahing over that little cutie. Hope you come with a name soon. Oh Gill your new addition really made me smile. 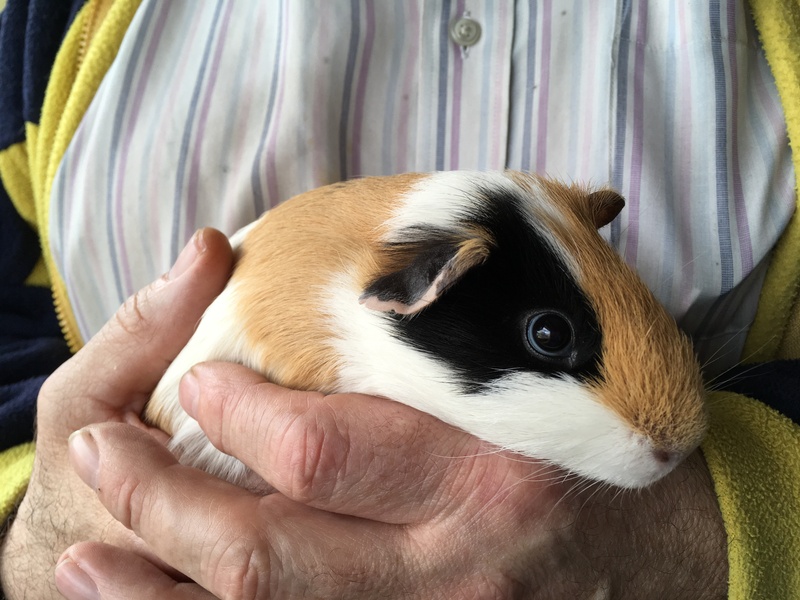 We used to have a garden full of free range guinea pigs when our children were growing up and I used to have classes of children from our local school to study them in our garden….oh happy happy times. I loved my piggies. Thanks for sharing yours.